Seeing All Sides: Stitches - Round Two! 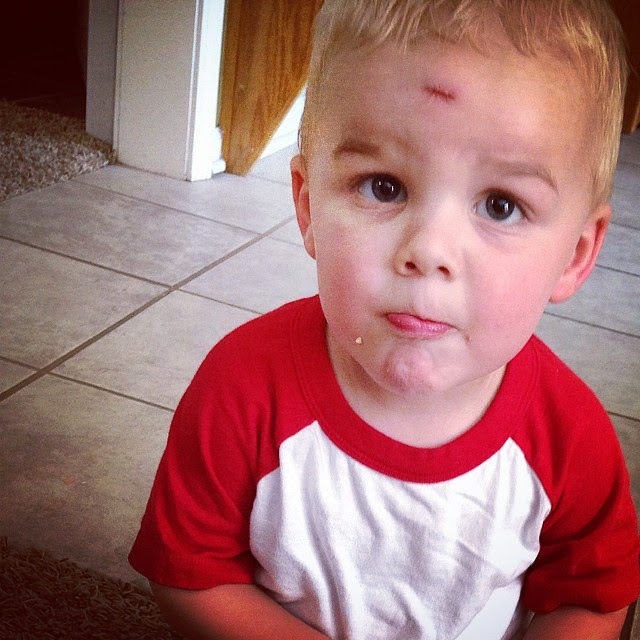 For the second time in eight months, Brantley headed to Urgent Care for stitches. This time, he fell against our neighbor's fireplace on what was a relaxing August evening. He busted open the same scar on his forehead from his stitches last fall, and we knew immediately it would require stitches. (They warned us of this.) We rushed to get there, but only because Urgent Care would close in less than an hour. We were those people who showed up near closing time...but Urgent Care sure beats the ER! Brantley was fine before we even loaded the car. Tough guy, he is! He wasn't, however, a fan of having the nurse/doctor look at it and had to be pinned down when they actually stitched up the gash. Yikes! Talk about tugging at this mama's heart strings! Like I said before, this kind of stuff makes me squeamish and does not make me a good boy mom!